DR. LEONARD G. HOROWITZ’S OPEN LETTER OF APPEAL TO THE ACLU TO BRING A LAWSUIT TO STOP THE ONGOING VACCINATION GENOCIDE–” VACCINECIDE “. You may be familiar with my work from many sources including an instant Internet search. I am the doctor largely responsible for Barack Obama’s pastor of 20 years, Rev. Jeremiah Wright, ministering to his congregation: “The government lied about inventing the HIV virus as a means of genocide against people of color. Governments lie;” and in defense of that statement, “Have you read Dr. Leonard Horowitz’s book, Emerging Viruses: AIDS & Ebola [Nature, Accident or Intentional?] Similarly, I am also the primary source of scientific evidence withheld by the U.S. Centers for Disease Control (CDC) justifying Nation of Islam Minister Louis Farrakhan’s prohibition against vaccinations as a form of genocide. “The struggle to overcome discrimination while respecting religious liberty is a recurring challenge in our nation’s history. . . But when that sincere, personal opposition becomes enacted law and public policy, the necessary consequence is to put the imprimatur of the State itself on an exclusion that soon demeans or stigmatizes those whose own liberty is then denied.” 135 S. Ct. 2594, 2602 (2016). This matter of deprived liberties and even lives impacts not only religious persons forced to receive vaccinations by an increasing number of state mandates, but all citizens, albeit disproportionately damaging the African-American community and vaccinated boys especially. This matter is of tremendous social concern and media interest at the time of this writing. The film VAXXED premiers today in New York City, after being censored by the Tribeca Film Festival and actor Robert De Niro, who breached contracts with the film-makers—respected medical journalist Del Bigtree, and the grossly libeled medical doctor and film’s director, Andrew Wakefield. Material documents and facts published in VAXXED irrefutably expose scientific evidence tampering at the CDC concealing the nearly 300% increase in vaccination injuries damaging African American boys compared with far lesser numbers of white children, although all children of color or not are being severely damaged by vaccines, and not only the MMR vaccine. 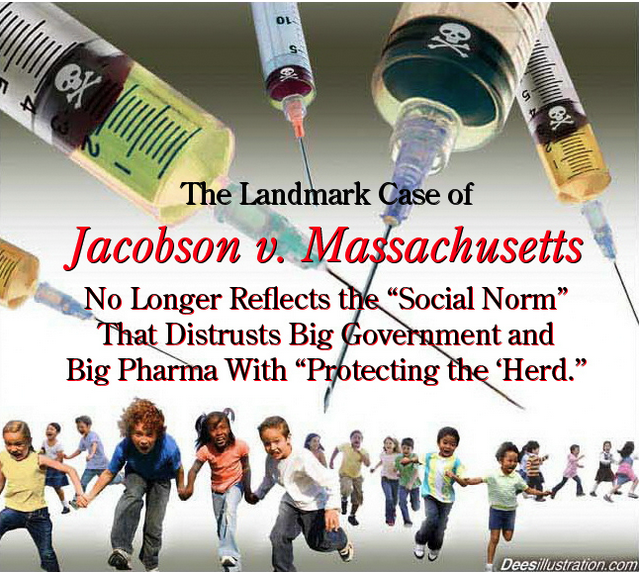 This claim is verified by the U.S. Food and Drug Administration (FDA) that references the package insert advertising the diphtheria, tetanus, pertussis (DTP) vaccine that is similarly causing “adverse events” that include “autism.” Some of this evidence has already been put before members of the U.S. Congress by Florida Rep. Bill Posey, and hearings are pending on these matters. The discovery evidence condemns the “regulatory capture” of America’s principle health and consumer protection agencies by the pharmaceutical industry profiting from both vaccine sales and their damaging side effects. In recent days, my colleagues and I have published compelling new evidence indicting the main “cell” of media propagandists—agents and agencies tainting the social and mainstream media with pro-vaccination propaganda, disparaging and libeling scholars, scientists, and consumer advocates opposing vaccination risks, and coordinating attacks against “free speech” to censor opponents to “vaccinecide,” as demonstrated by the mainstream media’s response to VAXXED. These groups are identified as commercially operating in association with U.S. military officials’ spin-off companies established to purportedly secure U.S. National Security’s commercial interests. These groups include: (1) the McChrystal Group; (2) Crosslead; (3) Axiom Learning; (4) SAB Group; (5) PRISM Learning; and possibly (6) the Novitas Group that may be associated with Notivas Solutions—“an administrative services processing company for government-sponsored health care programs.” Financing for this racketeering enterprise comes largely from major private equity investment firms and the Bill & Melinda Gates Foundation, or Bill Gates as an individual. Accordingly, I hereby petition the ACLU to represent citizens of America by filing said complaints naming the CDC and complicit parties in the U.S. National Security industry acting in association with certain mainstream media companies to not only defraud consumers worldwide using false assurances of vaccine safety and efficacy; not only committing unfair competition and deceptive trade by vilifying and industrially disparaging alternative makers and advertisers of safeguards against infectious diseases to exclusively sell vaccines; but for committing and concealing genocide—the mass killing and enslaving of people for profit. Claims of racketeering and conspiracy under color of law, aiding-and-abetting the commission of genocide, must be brought by reason of the evidence at hand. My colleagues and I anxiously await your response.